Click Ancient Brundisium Map for a “FREE” download of this page in PDF format. In September 40 BC, misunderstandings brought Mark Antony and Octavian to the brink of a civil war. Antony was most angry about the fact that Octavian had taken control of his eleven legions in Gaul. But perhaps he should have held his temper. He’d also just learned that his wife, Fulvia, and his brother, Lucius, had started and fought a civil war against Octavian in Italy. The primary motivation for this war was Fulvia’s jealousy of Cleopatra. Antony was living with her in Egypt at the time, and Fulvia thought the war would induce him to return to Rome. That didn’t happen, and she and Lucius lost the war to Octavian in the “Battle of Perusia” in northern Italy. When Antony heard about it, he sailed to Athens to meet with the already distraught Fulvia. After severely chastising her, he sailed to Brundisium. When he arrived there, the citizens and soldiers would not let him enter the city. Over the years, they’d built up their fortification walls to prevent against pirate attacks, and they were under strict orders from Octavian not to let any foreign armies enter. They didn’t recognize Antony’s ships. Antony was furious. 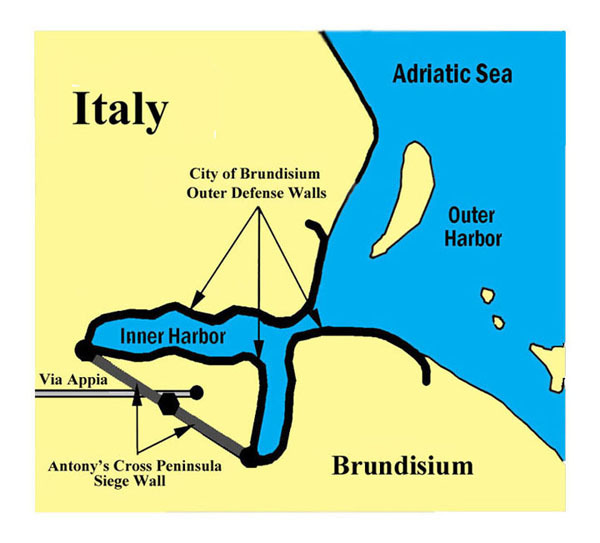 He had his men build a cross peninsula wall so that he could put Brundisium under siege and then sent his legions inland, into Italy, to confront Octavian’s men. He also sent a message to Sextus Pompey that he wanted to form an alliance with him against Octavian and that Sextus should immediately start attacking Italy’s ports. For his part, Octavian was not aware that Antony was coming. He was in Rome when he learned that Antony was ready to attack. He immediately marched his main army to Brundisium. Things appeared bleak for him at first, but after Marcus Agrippa defeated Antony’s army in a land battle at Sipontum, and Sextus’ forces were driven out of the ports of Consentia and Thurii, Octavian’s situation improved. Fortunately, for the both of them, cooler heads prevailed. The soldiers in each of their armies did not want to fight one against the other in what they saw as a feud between the two men. Then Antony received a message that Fulvia had died in Athens. He was told that, after their meeting, she had stopped eating and had died of a broken heart because he’d been so angry with her. Antony was saddened over this. He regretted that he’d been so upset that he’d left her without saying good-bye. After gathering his thoughts for a day, he told his commanders that he was ready to meet with Octavian. The two sat down and spent days carefully resolving their differences. The irony of it was that, at the end of the meeting, Octavian offered the hand of his sister, Octavia, in marriage to Antony. Octavia was known in Rome for her beauty and intelligence. Antony was pleased to accept. Cleopatra was forgotten for now.